How long does it take you to go to the store and come back home? Is it really all that convenient? When we lived in Halifax we were one block from the nearest grocery. Even then it would take five minutes each way, and 20 minutes when you were there – if you were lucky. Our grocery was in the heart of university territory, so you could always depend on healthy line-ups at the checkout. Here, the store is 10 minutes away, and no line-ups. But that’s still 25 minutes if you walk. It’s a darned good convenience store/gas station. It has a lot of stuff, but no extensive bakery like a “proper” grocery store. The sad thing about grocery baked goods is that they’re not very homemade tasting. There’s something about grocery bakeries that tastes, well, mass produced. So if you factor in the lack of taste – and time out of your day – to run for an evening snack, why not just stay home and make something? Brownies are a really good choice. They only take 40 minutes from start to finish. That’s 10 minutes more than my trip to the city grocery, and no cash outlay. Brownies are a great choice for an evening craving. Cakes are finicky and take over an hour. Pies require crust (which scares some people to death). You have to shape cookies and/or bake on multiple cookie sheets. Brownies are an entirely different matter. One bowl, a whisk and an 8”x8” pan. Mix, pour, bake and scarf down. 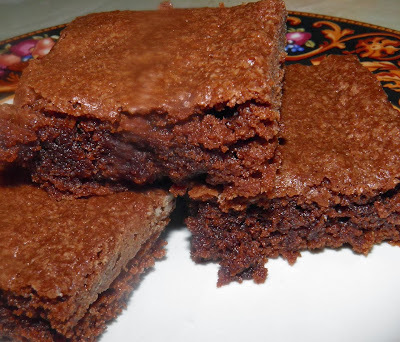 These brownies have a chewy interior and that crisp, brittle crust we all love so much. They also have an unusual twist. They’re kind of like a peanut butter cup – the ones where PB is surrounded by chocolate. Except in these it’s all mixed together. Just like when you eat the cups. I do have to admit, they’re pretty delish. I got the craving at 8pm last night. By 8:40 I had a plate of brownies in front of me, complete with a glass of milk. And I didn’t have to leave the house to get them. 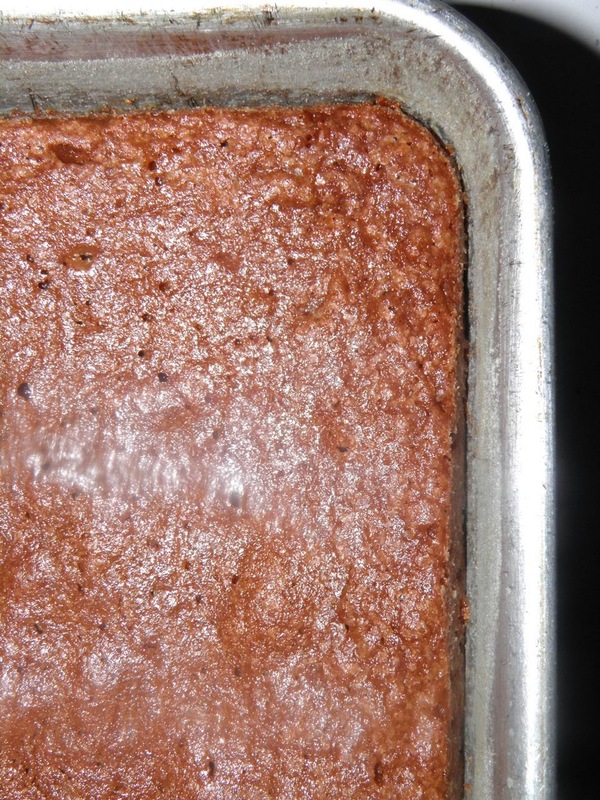 If you like brownies, give this recipe a try. Peanut butter may not be that common an ingredient, but it certainly works. It also makes them a little bit denser – just the way we like them! I honestly don't see how anyone could muck up this recipe. It's simplicity itself. Just don't over-bake and you're good. "barely pulling away" looks like. Preheat the oven to 350°F. Butter and flour an 8” square pan and set it aside. Place the butter, peanut butter and oil in a microwave-safe bowl. Nuke on “high” for 1 minute 30 seconds. 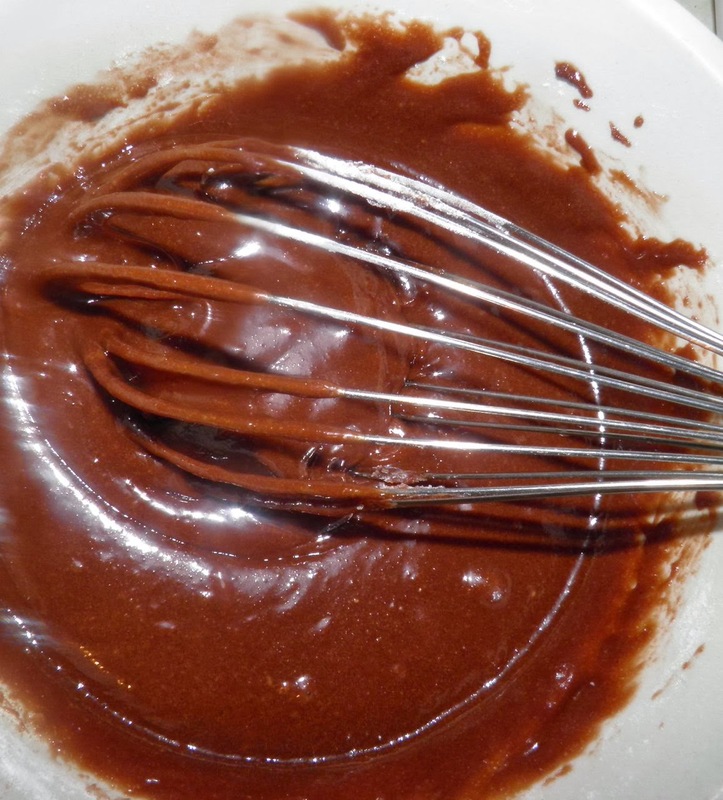 After heating the PB, oil and butter, whisk briefly to make smooth. Then whisk in the sugar, flour and cocoa. Then add the eggs, vanilla, salt and baking powder. Pour the batter into the prepared pan. Bake in the centre of the oven for 30 minutes, until the brownies just barely start to pull away from the edge of the pan. Do not over-bake, or the brownies will be dry.